The presence of a large number of followers, including women and children, inside the ashram has forced the police not to use firearms to storm the ashram. Around 4,000 followers left the ashram on their own or were evacuated by the police in Haryana Roadways buses. A Rohtak court today made controversial Sant Rampal an accused in a case of fraud. The case pertaining to forged registration of land of Satlok Ashram at Karontha village in Rohtak district was lodged in 2006. The Khattar government’s inept handling of the first major crisis in the state in arresting sect head Rampal and attack on mediapersons by the police at Barwala came in for severe criticism at the hands of its political opponents. Dera politics has been an integral part of the state’s political system, but politicians indulging sect heads for votes are finding themselves at the mercy of these religious leaders. Last week, nearly 30 BJP MLAs went to Dera Sacha Sauda to meet Gurmeet Ram Rahim Singh and thank him for the sect’s support in the Assembly poll. The handling of the Sant Rampal issue must be seen in the backdrop of this “reverence” for deras. Sant Rampal, who claims to be the incarnation of 15th century mystic poet and saint Kabir, whose writings have greatly influenced the Bhakti movement, holds quite cosmopolitan views and wields considerable influence over people. With the bureaucracy taking over all offices available in the Ambala Municipal Corporation’s two buildings in the cantonment and the city, elected representatives have been pushed out of the premises. The police booked four members of a gang who duped a man by promising to get him married. The gang got him a bride in exchange of money, but the procured bride duped the groom’s family and ran way a few days after the wedding, the police said. Gulshan Kumar (45) of Jagadhri’s Ganga Nagar colony died after he immolated himself on Tuesday afternoon. The police said he poured kerosene on himself and set himself on fire around 3.30 pm when his family members were not at home. Members of the Rezang La Shaurya Samiti organised a function at the Dhaaruhera Chungi memorial here today in honour of the brave men — most of them Ahirs — who laid down their lives defending the Rezang La post from the Chinese in Ladakh’s Chushul Sector in 1962. The body of an NRI was found in a field near Sarsa village in Pehowa today. The deceased has been identified as Amarjit Singh of Mukimpura village. After the Gohana bank heist, several banks in the district are on alert and have stuck notices informing the customers that they would not be responsible for the belongings kept in the lockers. The Kurukshetra district jail will be developed as the country’s first model jail and the jail superintendent has been directed to prepare a plan for this. This was stated by Haryana Lokayukta Justice Pritam Pal. The police recovered body parts of an unidentified youth from a plot in Mohan Nagar here today. The parts were scattered in a 200-square-feet area. Stray dogs were eating the parts when locals noticed them. The Municipal Corporation of Faridabad (MCF) has served a notice on a company that was allotted the contract of recycling and disposing of the waste for recovering Rs 5.35 crore dues. The unclean surroundings around the Mini-secretariat here cast a shadow on the district administration’s claim of making the city polythene-free within three months. Primary teachers, who were selected by the previous Hooda government over three months ago, today took out a protest march and staged a dharna at the mini-secretariat in Narnaul town here to press for their demands. 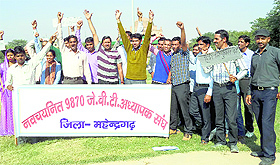 Primary teachers stage a demonstration at Narnaul in Mahendragarh on Tuesday. A documentary, “Har Boond Naya Sawera”, highlighting the pain of thalassemia patients and the importance of blood donation, won the first prize in a national-level documentary competition held at Chitkara University, Rajpura, on Saturday. Nitin Kumar (21), an engineering student, who went missing under mysterious circumstances on November 14, was found murdered along the NH-10 near HSIIDC office here today. The Rohtak operation circle of the Uttar Haryana Bijli Vitran Nigam (UHBVN) has cut the power connections of nearly 1,100 consumers who owed about Rs 4 crore to the nigam. The USA is willing to enhance mutual cooperation with the Haryana government in the fields of agriculture, marketing, horticulture and dairy development, an American diplomat said today. The literary academies are set to be recast in Haryana after the change of guard in the state. The appointment of office-bearers of Sahitya Academy, Sanskrit Academy Urdu Academy, Punjabi Academy, Histroy Academy and Granth Academy that function under the Information, Public Relations and Cultural Affairs Department would be cleared by the Chief Minister’s Office as the department is being held by Chief Minister Manohar Lal Khattar. 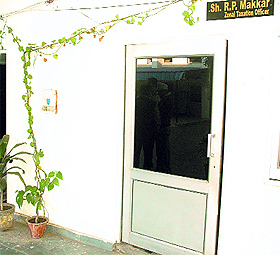 The Haryana Advocate-General’s office is in the process of revamping itself. All law officers, appointed during the tenure of the previous Congress government, were today asked to put in their papers. Fresh appointments are likely to be made after a new policy for the appointments is in place. The police suspect that there are nearly 8,000 followers and their safety is the concern of the police during the operation to arrest Rampal. Sources said many followers had been held inside the ashram against their will. Around 200 persons, who left the ashram early this morning, gave mixed reactions. Some of them said they were held inside the ashram forcibly, while some others maintained that they were inside the ashram of their own free will. One of the woman followers from Meerut, Bhanu, said she wanted the leave the ashram, but was told by the ashram officials to stay back as the police would take action against them as soon as they would go out of the ashram. Another follower, Varsha, said she wanted to leave, but ashram officials did not allow her. She said there was shortage of essential commodities, including eatables and water, in the ashram. “They have started rationing water and eatables and give very small quality of water and food to the followers,” she added. “Several followers want to leave the ashram, but some armed persons are keeping them inside. Who would want to stay without food and water for several days? The condition of children is worsening for want of proper food,” alleged TB patient Rajmal (45), who succeeded in fleeing the ashram along with his son Gholu (12) today. He left on the pretext that he had run out of medicines. He reached the Jind railway station in the evening. Rajmal claimed that armed black commandos had held hostage thousands of followers. “Like me, thousands of others want to leave the ashram, but they are being forcibly kept there to use them as a shield during clash with the police,” he alleged. Rajmal belongs to Mangolpuri area in New Delhi. He, along with thousands of other followers, was called to the ashram on the pretext that Rampal wanted to organise a satsang. “When the disciples tried to leave the ashram, armed aides of Rampal locked gates and threatened them not to leave the premises else they would lose their lives,” he alleged. “There’s no truth in the claim that Rampal has left the ashram. He is very much there and begging support from his followers to save himself,” alleged another follower Mehar Singh from Meerut. 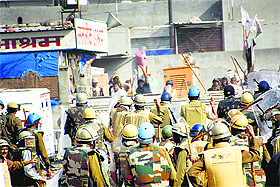 Nearly 4,000 devotees of sect head Rampal have left Satlok Ashram and sought police help. Sources said the devotees had been leaving the ashram of their own free will and the police detained them. “The police have started screening of the people and will let them go after comprehensive interrogation and clarification of antecedents,” IGP Anil Kumar Rao said, adding that the criminal elements, if any, would be arrested, while the innocent persons would be helped in reaching their destinations. As per the case, Rampal and his supporters had got the ashram land fraudulently registered in the name of his trust in 1999. The complainant, Kamla, had maintained that some other woman named Krishna was produced in her place for getting her land registered in the name of Rampal’s trust. The police had lodged an FIR under Sections 419, 420, 467, 468, 469, 120-B and 471 of the IPC. “The state government has not been able to responsibly resolve the matter,” former Chief Minister Bhupinder Singh Hooda said, adding that the government, Rampal and his followers should find a peaceful way out to end tension in the state. Condemning the attack on mediapersons, Hooda asserted that the police should have exercised restraint as the mediapersons were only doing their duty and not siding with anyone. RS Choudhary, INLD general secretary, came down heavily on the failure of the state machinery to execute the orders of the Punjab and Haryana High Court. However, the more condemnable was the attack by the police on mediapersons, who were discharging their duty by disseminating information to the public, Choudhary added. Rajeev Godara, AAP’s Haryana chief spokesman, said the delayed operations to arrest Rampal had exposed the inexperience and immaturity of the Khattar government. Meanwhile, the unprovoked attack on the mediapersons had brought the brutal face of the Haryana police to the fore, he asserted. While the BJP state leadership kept a low-profile preferring DGP SN Vashisht, Additional Chief Secretary (Home) PK Mahapatra and Principal Secretary to CM Sanjeev Kaushal to field questions from the media, alleged derogatory remarks by BJP Haryana in charge Anil Jail on media sparked off a row. Apparently mocking at the media for telecasting violence outside the Satlok Ashram at Barwala live, Jain had reportedly said dharna and protests were not cricket matches that needed to be telecast. Several journalists on duty were injured in attacks on them by the police personnel. The police action on Rampal’s followers at Satlok Ashram for “obstruction” in performing their duty came as a knee-jerk reaction after the HC pulled up the state machinery. Even today, after initial action, the policemen retracted. Is the police going soft on Rampal who commands influence in the region? After the court ordered his arrest, why did the police not act for over one week? This delay allowed the dera opportunity to gather women and children to form a human shield around Rampal. According to a police source, ashram followers managed to accumulate weapons and make petrol bombs making its task very difficult. This may be termed as the police’s failure to act in time, but sources say directions for quick and effective action had to come from the political masters, who left the handling of the issue to the police. The police had two options: act swiftly without warning or to give dera followers time to leave. It preferred the latter, which has boomeranged. The delay in police action (to comply with HC orders to arrest Rampal and bring him to court in a contempt case) appeared to have resulted from failure of directions from the political leadership. The indecisiveness on part of the police led to frustration in lower-rung officials. 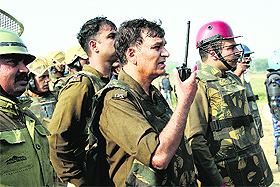 Policemen camping outside the dera for several days lost their cool and attacked not only mediapersons, but also a superior. No one has clear answers about why the “build-up” was allowed, given Rampal’s background of never shying away from controversy. 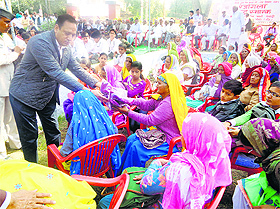 Rampal, who was a Junior Engineer (JE) with the Irrigation Department of the Haryana Government, till his “resignation” in 2000, teaches his disciples to consider all religions as one and is reportedly opposed to the Hindu rituals of worshipping gods, holding fasts and indulging in any other Hindu religious practices. Born in a family of farmers in Dhanana (Sonepat) on September 8, 1951, Rampal sought voluntarily retirement after 18 years of service to dedicate himself to spirituality. When he was still in government service, Rampal came in contact with Kabirpanthi saint Ramdevanand. 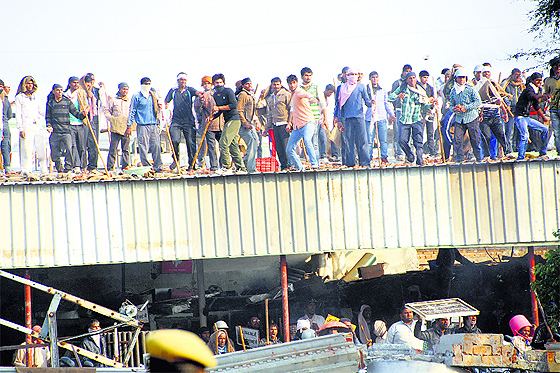 While still in government service, Rampal set up his own ashram at Karontha (Rohtak) in 1999. He plunged head-on into spirituality after 2000 after proclaiming himself as a “saint” and starting setting up ashrams across the state. The number of his followers swelled as word went around of his being an “incarnation” of Kabir. It was a smooth sailing for him till 2006 when he allegedly made certain derogatory remarks against Arya Samaj founder Swami Dayanand Saraswati. His supporters clashed with angry Arya Samajis, resulting in the death of one person. He was arrested along with 24 others, but was let off on bail. He then shifted base to the current ashram in Barwala, Hisar, which is in the eye of storm now. 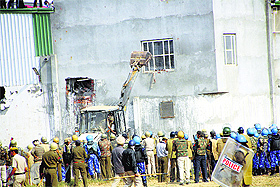 The controversial sect leader’s followers had indulged in vandalism in a court in Hisar in July this year when Rampal was going there in connection with a 2006 murder conspiracy case. The current contempt of court is an offshoot of that violence. The Punjab and Haryana High Court yesterday directed the police to arrest Rampal and summoned him on Friday. Rampal, who is also facing contempt charges, has failed thrice to appear in the court in two weeks. Rampal has skipped the court at least 43 times in the past four years. All corporators — barring Mayor Ramesh Mal — have no place to sit and meet the public. While Deputy Mayor Sudhir Jaiswal has been allowed to use the Mayor’s room in the MC’s Cantonment building in his absence, Senior Deputy Mayor Durga Singh Attri and 16 other corporators can be seen sitting on benches or moving amongst the public listening to their grievances. A source in the corporation said a major controversy was created when the MC Executive Officer took off the name plate of the Senior Deputy Mayor from outside one of the offices in the MC’s cantonment building and put his own nameplate before handing over the office to the Zonal Taxation Officer. A delegation of corporators met the Deputy Commissioner last Friday and was assured appropriate action. Deputy Mayor Sudhir Jaiswal said elected members used one of the rooms at the back of the MC building, but that too was taken over by the Municipal Engineer. “This is a mockery of the status of elected representatives. We don’t have a place to sit,” he said. MC Executive Officer Arvind denied controversy over the removal of the Senior Deputy Mayor’s nameplate. He said the room was not allotted to any elected representative. Mayor Ramesh Mal said he had taken up the removal of Attri’s nameplate without his knowledge and the issue would be resolved soon. On the issue of no space for corporators to sit, the Mayor said it was decided to get new offices constructed soon for corporators during the last House meeting. The police booked Simran and Jasbir Kaur, both residents of Mansa district, and Preet Pal Singh and Sukha Singh, both residents of Chimo near Ratia town of Fatehabad. Jaswinder Singh, a resident of Ranjit Singh Theri village of Sirsa, had filed a complaint with the district police some time back and the SP had entrusted the inquiry to the Ellenabad DSP. The case has been registered after the completion of the inquiry. Jaswinder worked as farm labourer in Ranjitpur Theri village of Sirsa and being a landless labourer, he could not find a bride for himself. Sukha Singh introduced him to Preet Pal Singh and said he could provide him a suitable bride for marriage. Preet Pal agreed to provide bride on the condition that Jaswinder would have to gift him a two tola gold ring in return. He introduced Simran to Jaswinder and said since her mother had died long ago and her father was critically ill, they would not be able to participate in the wedding. Eventually, Preet Pal acted as go-between and Jaswinder’s wedding was solemnised with Simran on July 10 this year. Jaswinder spent a lot of money on his wedding. However, 10 days after the wedding, Simran told Jaswinder her father was critical and she had to meet him. Jaswinder gave her Rs 1 lakh for her father’s treatment and a mobile phone with a new SIM card. However, Simran did not return and switched off the phone. After waiting for a few days, Jaswinder brought a duplicate SIM of the same number, but the first call he received on the mobile was from a man Gurpreet, from Dhuri, who claimed to be Simran’s husband. Later, it was revealed that he too had been duped by Simran. As many as 65 war widows and family of five soldiers who laid down their lives in World War I were honoured by chief guest and Vir Chakra recipient Captain Ram Chander Yadav at the Rezang La Smarak here. Samiti president Sanjay Rao presided over the function. Describing the historic importance of Rezang La Martyrs Day, Naresh Chauhan, founder general secretary of the Samiti, said the battle was fought between the Charlie Company of the 13th Kumaon Regiment and the Chinese army at the 16,420-ft Rezang La post. “The country lost 114 soldiers, including company commander Major Shaitan Singh, in the battle. Of the 114 martyrs, 111 were Ahirs and 57 were from Haryana. As many as 1,310 Chinese soldiers were killed in the battle,” said Chauhan. Unanimously passing a resolution on the occasion, the Samiti demanded the government include the sacrifice of soldiers in the Rezang La battle in school and college syllabi and declare November 18 as Rezang La Shaurya Divas. The deceased’s brother, Baljit Singh, said Amarjit was living in Germany for the past eight years and he had come home around a month ago. “He went to meet his friend last evening (Monday). The family lost contact with him around 11 pm. This morning, a person informed the family that Amarjit’s body was lying in the field,” Baljit said. In the notice the bank management has also appealed to the customers to get their belongings insured as banks would not be responsible for any damage or loss. As per the sources, the notices were already displayed in the locker rooms, but after the Gohana incident, the bank managements have stuck such notices at the entry points of the banks so that customers are in the know. There are 294 branches of various banks in the district, and around 50% of these have locker facilities. Meanwhile, customers had a mixed reaction over the step taken by the bank. While some welcomed the move, others criticised it and said it was a step to show that banks were running away from their responsibilities. Munish Kumar, a resident of Sector-8 said the bank should take responsibility of the lockers and the contents kept in it because they charge rent for maintaining the lockers. He said he would inspect the jail every month and keep a close watch on every activity of the jail. The Lokayukta also saw the paintings and models prepared by the prisoners under vocational courses and asked the jail superintendent to prepare a list of educated prisoners. He appealed to the authorities to set up a biscuit factory and other vocational set-ups and also directed to fix a daily schedule of two hours for resolving the problems of prisoners. Earlier in the day, the Lokayukta attended a national seminar on “Human Rights: Trends and issues in contemporary world” on the campus of Kurukshetra University. Deputy Superintendents of Police (DSP) Darshan Lal Malik and Virender Singh, along with the police and forensic teams, reached the spot. After conducting the preliminary investigation, the police collected the body parts and brought these to the Civil Hospital for the post-mortem. AKC Developers, which had abandoned the waste recycling plant in October 2013 after a fire incident, has failed to restart the plant, making the civic body terminate the contract in October this year. The plant built at a cost of Rs 75 crore was made operational in September 2011 to dispose of and recycle around 1,000 tonnes of waste generated on daily basis. “We have already taken steps to seize the bank guarantee of Rs 3 crore deposited by the company, as it failed to resume work in the past 13 months despite several notices and reminders,” said Suprabha Dahiya, Commissioner, MCF. She said the company defaulted on the terms of agreement and failed to heed to all warnings so far, resulting in problems regarding the disposal and recycling of the waste generated from the city. She said while the contract had already been terminated, the MCF had initiated the move to recover the financial loss accrued to it due to non-fulfillment of the contract by the defaulting company. She said the MCF would recover the dues to the tune of over Rs 5 crore through the bank guarantee and the provisions entailed in the agreement. The plant and its machinery would be taken over by the authorities soon. The plant which was expected to recycle 1,000 tonnes of waste daily from Faridabad and Gurgaon was handed over to a private agency after a formal agreement in September 2010. However, the plant went out of order in October 2013 after the company running it claimed that it had suffered major breakdown due to a fire incident at that time. The plant is built on 25 acres on the Faridabad- Gurgaon road. The work for keeping the building clean has not been assigned to an agency since it was inaugurated in 2004. “Heaps of garbage can be seen outside the district headquarters. In spite of the ongoing Swachh Haryana Abhiyan (cleanliness drive), the building appears to be unattended,” claimed Ravi, who visited Mini-Secretariat on Tuesday. “Public toilets stink. Sweepers have not been employed to keep the toilets clean. Besides, there is hardly a dustbin on the premises,” Surender Kumar, a self-employed person, said, adding that alleys and lobbies of the six-storey building were not regularly cleaned. “The building of the Mini-secretariat built for around Rs 12 crore has never been whitewashed from the outside,” claimed an employee on the condition of anonymity. The technical hitch reported in this matter is that the building has not been formally handed over to the PWD department that ought to maintain government buildings. He said several sweepers had been hired, while officials concerned had been told to place dustbins in the buildings and whitewash the entire building. “Several institutions and associations had joined the cleanliness drive to make the city polythene-free,” the DC added. The teachers demanded the government to release their joining and posting orders at the earliest so that they could join their duty in government schools. The teachers gathered at Subhash Chander Park in Narnaul and proceeded towards the mini-secretariat. “The previous government had announced the result for 9,870 posts of primary teacher on August 14, but could not issue the joining letters due to the imposition of the model code of conduct for the Assembly polls. The present regime has put the teachers’ future in jeopardy by ordering review of the appointments,” said Ashok, a primary teacher. The teachers urged the government to issue posting orders immediately so as to meet the staff shortage in government schools. The short film was made by students of the department of mass communication and media technology of Guru Nanak Khalsa College, Yamunanagar. The film shows how every drop of blood brings a new life to thalassemia patients. Every week, fortnight and month, they need fresh blood to save their life. “Focusing on the pain of thalassemia patients, this short film gives us a message for frequent blood donation so that the lives of needy people can be saved,” said Dr Uday Bhan Singh, head of the department of mass communication of the college. He said the film was made by the second-year students of Bachelor of Mass Communication of the college. He said the film was directed by Naveen Tomar and scripted by Rajat Chaudhary. The camera work was done by Nikhil Balooja, voice over by Nandini and the film was edited by Rohit Rana. 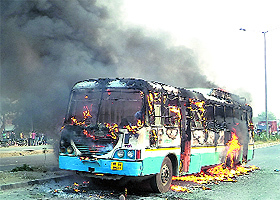 Infuriated over the incident, the kin along with other people not only disrupted traffic on the national highway, but also torched a Haryana Roadways bus and a traffic police booth near Sector 9 here. The kin refused to cremate the body until the killers were arrested. The situation remained tense as the blockade till the filing of this report. According to reports, some passersby spotted Nitin’s body lying in the bushes along with his motorcycle. Nitin’s kin and several others rushed to the spot on getting information and blocked the NH to protest the incident. Though the police tried to pacify them, but to no avail. In the meanwhile, a significant numbers of people along with other family members of the deceased, disrupted traffic near Sector-9; as soon as the roadways bus reached the spot, the protesters first smashed its windowpanes and then set it on fire. They also torched a traffic police booth located near the spot. Nitin was a B.Tech (final year) student and had gone to college on his motorcycle on Friday, but did not return. Though a FIR was lodged on the same day, but the police did not pay any heed, the deceased’s kin said. They alleged the police failed to find out the kidnappers’ location who made a call from Nitin’s mobile and demanded a ransom of Rs 1 crore in lieu of leaving him a day after the incident. The power consumers of urban areas under the Rohtak circle owe nearly Rs 16 crore to the nigam while domestic consumers in the rural belt of the circle owe a whopping Rs 200 crore. The Rohtak operation circle launched a month-long drive on November 1 to recover the defaulting amount from the power consumers concerned. Special raiding teams also detected 111 cases of power theft and imposed a penalty of Rs 35 lakh of which Rs 14.5 lakh had been recovered in 15 days. “ We have recovered about Rs 4.25 crore from nearly 2,000 defaulting consumers, including Rs 20 lakh from government departments,” said VS Mann, Superintending Engineer (Operation), UHBVN, Rohtak circle. Mann said several government departments under the Rohtak circle that owed about Rs 3.25 crore to the power nigam had been served recovery notices. Even the Rohtak mini-secretariat which houses the offices of various government departments, including those of the local DC, SSP and SDM, owes Rs 18.5 lakh to the nigam. The IRB police Complex at Sunaria village in the district owes Rs 23.5 lakh, the local tehsil office Rs 13.25 lakh, litigants’ hall at the local judicial complex Rs 10 lakh, District Bar Library Rs 9.5 lakh, old ADC office Rs 2.5 lakh, Meham Municipal Committee Rs 75 lakh and the Sampla Municipal Committee Rs 87 lakh. The Rohtak operation circle comprises the entire Rohtak district and some parts of djoining Sonepat and Jhajjar districts. n	Power consumers of urban areas under the Rohtak circle owe nearly Rs 16 crore to the nigam, while domestic consumers in the rural belt owe a whopping Rs 200 crore. Allan Mustard, Minister Counsellor for Agriculture Affairs in the US embassy, who called on Haryana Agriculture Minister Om Prakash Dhankar stated this during a meeting held here to discuss issues of mutual interests, an official statemenet stated. Dhankar said the cultivation of horticultural and other cash crops had become more profitable as compared to traditional crops like wheat and paddy. Meanwhile, lobbying for posts of director and member of these academies has intensified. With a former RSS pracharak at the helm of affairs, the prospective candidates are exploiting their RSS ‘connections’ to bag these posts. The objectives of these academies include documenting contemporary literature, publishing books and journals, rewarding litterateurs and organising workshops and seminars. Over the years, these academies have become a parking place for the government’s favourites as their directors. Though several eminent persons from their respective fields had been at the helm of affairs in these academies, these had been highly politicised over the years with persons owing allegiance to the party in power heading these bodies. Sources say the Chief Minister will finalise a policy for the appointment of law officers in a couple of days. The law officers customarily resign after the change in government. Some of the officers stand the chance of being appointed again. All law officers, appointed during the tenure of the previous Congress government, were on Tuesday asked to put in their papers. Fresh appointments are likely to be made after a new policy for the appointments is in place.